Austin is very well known for its local businesses, including restaurants. Today I want to show how a small restaurant owner in Austin can benefit from utilizing Google Places to maximize its online presence. This goes to what we are always saying at Austin Webpages – Your small business is ALREADY ONLINE. Having a website and managing the various online tools should be in the short term goals of your online marketing strategy. Google also can make any small business look just as great an option as a big business or chain. In our restaurant example, lets say that a hungry person is near the South I-35 area, when they bring up their mobile device and look at their Google Maps app. Let’s also pretend they are looking for Mexican Food. Disclaimer: both of these places are great and I am not advocating for either of them in terms of quality of food or services. Our example on the left is of a local Mexican food restaurant, while our restaurant on the right is one of many restaurant chain locations. The example on the left is a typical result of a small business that has not taken advantage of the various tools out there to help small businesses, in this case Google Places. The example on the right is more or less the goal of what each small business can easily become with some online marketing management. Let’s look at a handful that are easy to see from the side by side comparison. 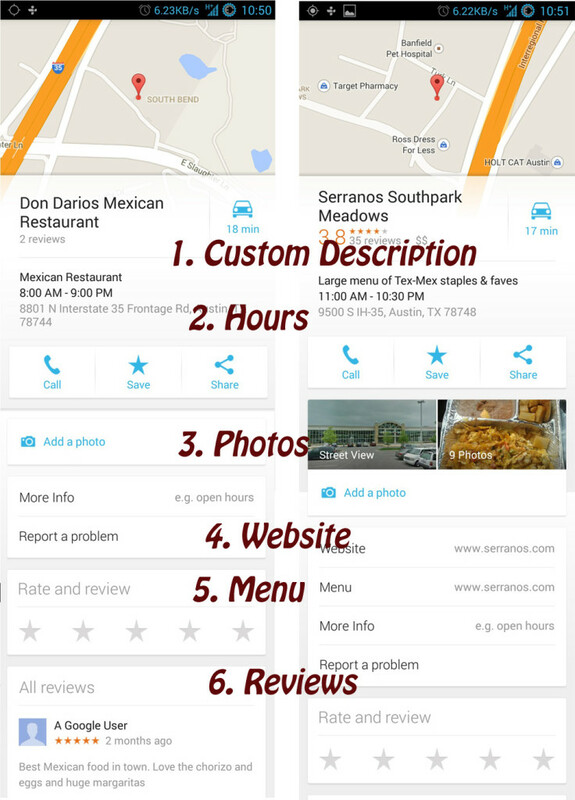 The example on the left shows a generic description “Mexican Restaurant”. On the right, you can see that this restaurant has chosen “Large menu of Tex-Mex staples & faves”. Not only do you get to customize the description, but with so many eyes looking at these apps and tools, you want your small business to stand out. The custom description can be part of a marketing campaign or simply your company’s tagline. Pretty self explanatory – you want your customers to know when and where they can find you. Both of these examples have the store hours listed, although the example on the right had a chance to review it for accuracy since they are controlling their Google Places account. Let’s face it – why read when you can just look at pictures! Photo’s of menu selections helps the chain stand out. From an online marketing point of view, it gives the restaurant chain more credibility. They are showing their customers what they can look forward to eating. Fast Food commercials show giant burgers as their visual for a reason! As we always tell our Austin clients – a website gives your business more legitimacy. A website allows your business to run 24/7 and expand your customer base. It also gives a central point of information about your small business, no matter if customers found you via google maps, twitter or were handed a flyer. . Now, they can go to your small business website and get more information and start interacting with your product and services. A restaurant could use a website to show even more pictures of their location, information about private events or book a reservation. A great perk that Google Places offers small businesses like restaurants is being able to list direct access to your menu. A restaurant’s menu is something that customers are going to be interested about right away, so it gives you quick access. The example on the right has both their website listed and then a direct link to their menu – whereas the example on the left has neither. Customers looking for a specific plate are going to have to call the restaurant, be possibly put on hold, just to ask about menu choices. Reviews are a huge part of the online world today. With the rise in online shopping, people are depending on each other for advice of where to spend their money. Google Places allows anyone on the internet to have reviews about a place of business. Managing your online profiles should include being aware of your reviews. A bad review is going to stick out, but the example on the right has the ability to respond to a review. They can address any issues, in front of all readers and hungry Mexican food lovers, showing that their customers come first. The example on the left even has a great review – but with no online profile…the small business will not be able to respond and thank that customer for their business. Let Great Products Speak for Itself! As in our previous blog posts, managing your online profiles requires a lot of time and some knowledge, that is why many small businesses do not do it or put it off for a long time. But taking advantage of these online tools levels the playing field. If the restaurant on the left managed their profile – their listing will look as great as the restaurant chain on the right. That is what small businesses want to do – level the playing field, so that their great products will speak for itself.